50: "The Mystery Duelist, Part 1"
97: "Showdown in the Shadows, Part 2"
Story 3: Battle City (part 1) (Ｓｔｏｒｙ（ストーリー）３ バトルシティ（前（ぜん）編（ぺん）） Sutōrī San: Batoru Shiti (zenpen)) is an arc in the Yu-Gi-Oh! anime. 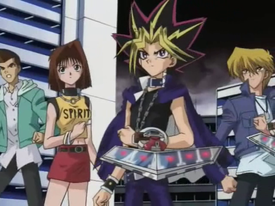 In the English dub, it has been referred to as Battle City Duels and Rulers of the Duel. It features the preliminary and quarterfinal rounds of the Battle City tournament. Japanese This City Will Become Battle City! Japanese Battle Ship Takes Off! English Let the Finals Begin! Japanese Jonochi vs. Trap Deck! Japanese The Inherited Card - Psycho Shocker Counterattacks! This page was last edited on 19 August 2017, at 00:39.